Dellorto VHB carburetors may leak gasoline out of the vent hole. This occurs when fuel has completely filled the float bowl and has no other place to go other than directly out of the vent hole. The flow is typically pretty impressive and evident within just 20 - 30 seconds after turning on the petcock. Obviously, this is a bad situation and one that needs to be rectified before starting the engine. Check the float for leaks and replace as needed. 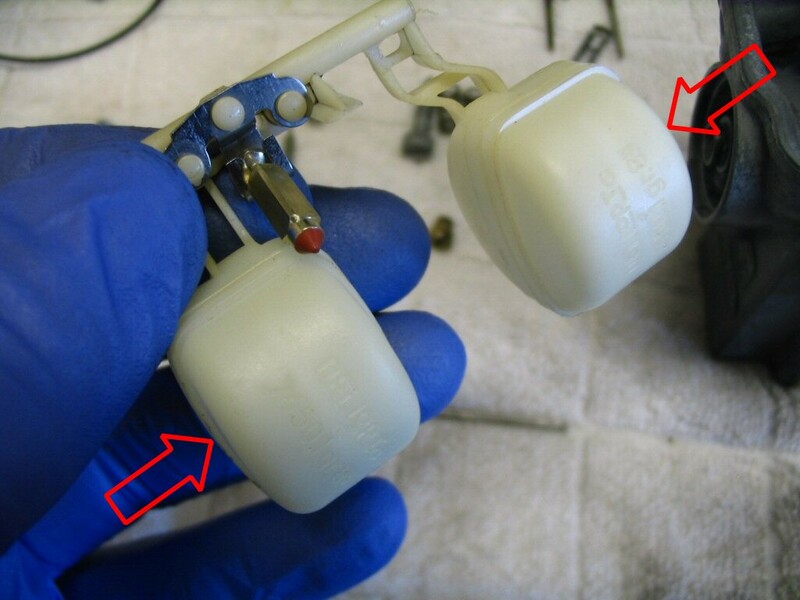 Check the Buna-N/Viton tip on the float valve needle and replace if it shows any signs of having an indentation where it has constantly pressed against the hole in the carburetor body. Properly set the float height. Start by checking the floats for excess material where the two halves are melted together during production (on each end). This is typically not a problem with original floats, but can be a problem with new replacement floats. I check all new floats for excess squeeze-out and trim them very carefully with a razor. The clearances are quite close within the float bowl, so the excess hangs up on the float bowl and prevents the float from moving. Before installing a carb, I always turn it over to make sure that the float is opening and closing as needed (just by listening to it move inside the assembled carb). Check for excess squeeze-out at these locations. If, after that, you still have leakage, then I suspect that the hole that the tip of the float needle seals against inside the carburetor body needs to be cleaned up. You can do this using an old needle and some basic rubbing compound. It can take a while to do this, but eventually you'll get the hole cleaned up nicely such that the float valve will seal against it. I have had this trouble on a few carbs, so it is not unheard of. Thanks to Mark Etheridge of Moto Guzzi Classics for this tip.